Hady Mawajdeh is an Arts Reporter and Digital Editor for KERA’s Art & Seek. Hady came to KERA from Austin where worked on “The national daily news show of Texas,” Texas Standard. At the Standard, Hady crafted stories and segments about the topics and headlines that mattered most to Texans. Prior to his work on the Standard, Hady lived and worked in Durham, North Carolina, where he worked as a producer at North Carolina Public Radio – WUNC. At WUNC he was able to work on the statewide news program The State of Things. Hady’s journalistic career began during college as an intern and freelance reporter at NPR affiliate KUT 90.5 FM Austin. 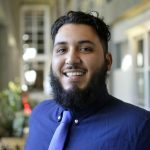 Hady was born and raised in Central Texas and attended college at Texas State University. Hady is obsessed with pop culture, music, photography and…ART! If you’d like to connect with Hady or simply see what he’s reading about, listening to or covering follow him on Twitter — @hadysauce.